Heat oven to 350°F. Grease 13x9-inch pan with shortening or cooking spray. In pan, break up cookie dough. With floured fingers, press dough evenly in bottom of pan to form crust. Bake 15 to 20 minutes or until edges are golden brown and center is set. Cool 30 minutes. 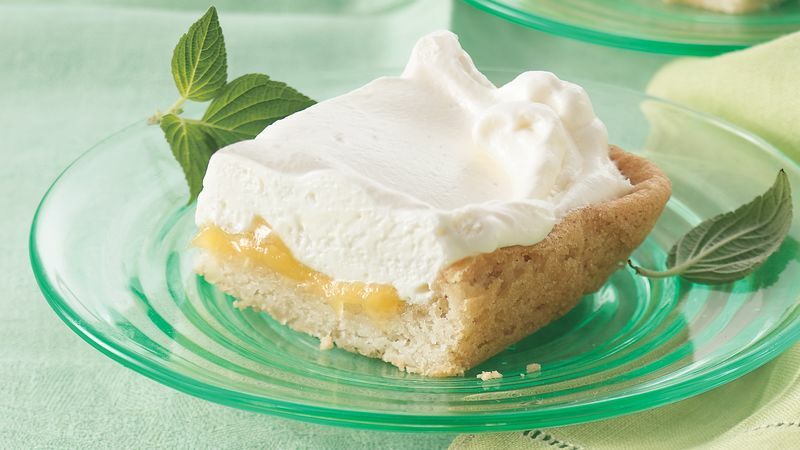 Spread lemon curd over cooled crust. In large bowl, beat cream cheese, marshmallow creme and yogurt with wooden spoon until well blended. Fold in whipped topping. Spread over lemon curd, swirling to look like meringue topping. Refrigerate at least 1 hour until serving time. For bars, cut into 6 rows by 4 rows. Store in refrigerator.